NSW Regional Science Hubs will present 39 new statewide Live Science events in 2016 to target 18-35 year olds. Inspiring Australia (NSW) will provide NSW Regional Science Hubs funds of $40,000 towards a number of new science engagement programs. Eight grants worth $5,000 each will go to support the delivery of community events that particularly target those in the 18-35 age bracket. All up, the eight Science Hubs to receive funding will deliver at least 39 state-wide Live Science events in 2016, presented in Lismore (5 events), the Blue Mountains (5 events), Dungog (6 events), on the Far South Coast (3 event types including 2 regular clubs), in the Cowra-Cabonne region (6 events), in Wollongong (3 events) and Wagga Wagga (11 events). Two new NSW Regional Science Hubs have been established as a result of this grants process; one in the Blue Mountains and the other in the Dungog region. Many of the events proposed are intended to evolve into regular event series once local sponsors and event partners are engaged. This event series will be held in local bowling clubs, the Lismore greyhound racing track, an environment centre in Dorroughby and via guided walks in popular outdoor nature spots. The program spans a number of different audience groups including Nerd Nites that targets 18-35 year olds with science speakers. The series builds on the previous success of Lismore’s popular Northern Rivers Arts Vs Science Festival and aims to broaden the Science Hub’s activities to developing a program that takes place across the year – including during National Science Week. Science at the Local is an initiative developed and trialled in 2015 by scientist Hamish Clarke with local high school science teacher Kevin Joseph and two Blue Mountains Neighbourhood Centres. The group form the core of the Blue Mountains Science Hub. March – Zombie Apocalypse: What Are The Odds? July – The Force Is Weak: Just What Is Gravity Anyway? In addition, each event will be documented in a Science at the Local podcast linked to the topics and featuring interviews with deeper discussion and special guests. The Science in the pub conversation series will present talks from a local or regional scientist every two months. Community conversations will draw on the scientist’s own research interests and be relevant to the local community to demonstrate the value of scientific research methodology as a tool for better decision-making and directly engage the community in this discussion. Discussion topics will also be explored in articles in the local press to extend the reach of the event. The regularity of the events will offer opportunities to build depth of discussion over time and to build a local science audience. The Science Hub also intends to run at least one day out in the field and one citizen science event to engage the community further and provide the opportunity for practical experience in the field. The citizen science event will have a practical session with a scientist to communicate the scientific research methodology employed. Topics might include: the science of hemp fibre (a local production interest), how learning to code will help our kids, living system technologies like renewable energy storage waste systems, flora fauna taxonomies and astronomy. This event series aims to extend the Science Hub’s focus on the natural world and biodiversity mapping to include ICT and innovation. The three programs proposed are intended to excite local people with the possibilities offered through STEM learning, and to promote skills acquisition in computer engineering and electronics, particularly to young female audiences. Monthly ‘Maker’ Club: held at CoWS near The Coast, a co-working space, community members will explore coding and physical computing using equipment such as Raspberry Pi’s, Circuit boards and 3D Printers. With expert support, community members will be encouraged to join a learning experience through a club-based environment. They will experience this learning in a practical, fun way thereby increasing understanding and perhaps even develop a passion for STEM, seen by many as offering the possibility of a strong future and certainly offering the potential of development and employment in regions through the sciences. Female Coding: a regular event will provide an appropriately supportive environment for females, especially but not only young adults, to develop their interest and skills in STEM. Four big ideas. Four nights in Armidale for scientists, politicians, farmers, philosophers and Australian citizens to engage in discussions, debates and deliberations. These events will invigorate scientific discussion, debate and deliberation in the public arena, and through radio broadcast, provide access to the largest constituency possible, building partnerships and trust throughout regional and rural NSW on big topics in science. The events aim to directly engage a broad age range by offering opportunities for people to discuss and think about big issues in science in Australia while in the pub. The Science Hub will also broadcast these events to other regional areas, creating partnerships with communications teams and STEM educators and thinkers in small towns. The group will seek to approach difficult and often controversial topics and showcase formidable personalities and experts. February – Shifting paradigms: How have radical ideas in science played out in the international arena to become ‘common knowledge’? Big thinkers and strong science come together to create seminal ideas that infiltrate society and culture. May – Feeding the world through changing climates: Hanging abiotic, political and cultural climates in Australia and across the globe throw complex challenges at every turn. How are Australian farmers handling this in order to feed their family as well as the world? Where does politics sit along this line? August – The STEM agenda – Science, Technology, Engineering & Maths. The race is on to develop a culture of curiosity and imagination, creativity and innovation. Australia’s Chief Scientist and Prime Minister alike are falling over themselves to embolden the entrepreneurial spirit, and for these opportunities to generate successful jobs, products and services. November – Playing God. Our DNA holds the secrets to our very humanity, and much more. But to many scientists it is akin to a Meccano engineering set. What are they doing? To whom or what? And why? To engage the region’s young adults, the Science Hub is taking science to unexpected venues: the region’s bars, wineries and the observatory, creating appealing and fun social events for the region’s young set curated with artful innovation by the team at the arts education consultancy The Corridor Project. February – Science in the Pub Palaeontologist Alex Richie will talk about the Age of Fishes and Bill Handke will discuss the Indian Myna. This discussion will be facilitated by Cowra Natural Resource Management. February – Science in the Library Palaeontologist Alex Richie will talk about the Age of Fishes and Bill Handke will discuss the Indian Myna. This discussion will be facilitated by Cowra Natural Resource Management. April Science of ceramics and kiln management Learn about the fascinating science of ceramics and kiln management at this workshop by scientifically trained ceramicist Rebecca Dowling. You can also try your hand at botanical illustration with local artist Heather Vallance. This workshop will be facilitated by the CORRIDOR project and the Age of Fishes Museum. March – Galaxy, SFX Darby Falls Observatory will host a night of sky gazing, through large telescopes, including DJs and electronic music inspired by the night sky, faciliated by the CORRIDOR project and Age of Fishes Museum. September – Sky stories The Corridor Project will host a night of Indigenous culture and knowledge relating to Wiradjuri sky stories, led by a Wiradjuri speaker, faciliated by the CORRIDOR project and Age of Fishes Museum. October – Sparklers at Wallington Wine Vineyard. Experts from Wallington Vineyards in Canowindra will discuss the alchemy of wine making, viticulture and the making of sparkling wine, faciliated by the CORRIDOR project and Age of Fishes Museum. 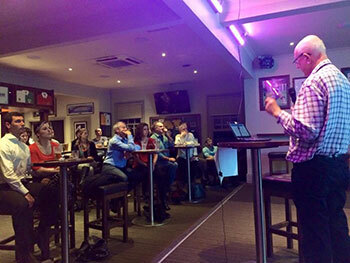 The Illawarra Science Hub’s Discovery Evening program builds on last year’s popular Science and Cider events. The live science program aims to present fun and interactive science presentations to a young adult audience who would not normally visit the Science Centre or have an interest in science. The subject is the hook to bring them to the Centre and then we subtly introduce some basic science. March – The Science of Chocolate: Working with a local chocolate maker, the event will present different types of chocolate and the challenges of making it. This would be followed up with opportunities to make chocolate and various tasting opportunities around the exhibition. May – Science of the Dead: The Gruesome Science Evening would be a joint presentation by two recognised experts, James Wallman, forensic entomologist and Xanthe Mallet, a forensic anthropologist. Each will give an insight into the world of CSI and forensics focusing on the human body. This will be followed up with an opportunity to take part in various interactive activities which include the dissection of various animal organs and some additional forensic activities. October – The Science of Wine: The Wine Evening will start with an informative presentation by a local wine maker Simon Hall from Two Figs Winery and graduate of Charles Sturt University, He would give a fun and informative presentation about the process of wine making and the science, chemistry and biology behind it. This will be followed with tasting at various stations in and around the exhibition. In 2016 the Riverina Science Hub is committed to reaching new audiences who do not usually engage with science or scientific concepts. The proposed monthly events targeting 18-35 year olds will run from March to November and take place in a range of alternative non-traditional science venues including pubs, wineries, on-bus seminars, in the natural environment and at a brewery. Nerd Nite: The formula is simple, three presenters get 30 minutes each to share a topic they’re passionate about and take questions from the audience. Speakers from science, arts and nonspecific backgrounds stimulate the audience to explore and discuss science across a wide range of current and challenging topics. Sparkle in the Vines: Participants will take part in two workshops conducted six month apart at Charles Sturt University Winery. Under instruction from students of the School of School of Agriculture & Wine Science participants will learn about the various stages of producing a sparkling wine including assemblage, tirage, riddling disgorging and corking. The Science of Beer: Brewing dates back to the Ancient Egyptians. Yes… they constructed pyramids and they made beer. Long before the science behind fermentation was understood human kind was enjoying the dividend of the process. Learn the art and science behind every great brew. Eucalyptus What? Ask any Australian “what Eucalypt is that?” And more often than not you’ll get the reply “it’s a gum!” With nearly 900 eucalypt species in Australia, identification can present a few problems. Join us for a bus tour through some of the regions great stands of Eucalypts and expand your ecological literacy of these iconic trees and how they impact our environments. Traditional Knowledge Exchange: A walk through country with expert Rod Mason will showcase how traditional Aboriginal land management practices can inform and improve the ecology and diversity of our regional landscapes. Weedwise Communities: A hands on approach to weed identification and management using the mobile app, NSW Weedwise developed by National Parks and Wildlife. This citizen science workshop will be led by a local Vegetation expert. Nerd Nite: The formula is simple, three presenters get 30 minutes each to share a topic they’re passionate about and take questions from the audience. Speakers from science, arts and nonspecific backgrounds stimulate the audience to explore and discuss science across a wide range of current and challenging topics.